During its 102-year celebration, Bigge Crane and Rigging Co. announced the expansion of its fleet with 24 new Kobelco CK1100G-2 crawler cranes. According to Weston Settlemier, President and CEO of Bigge, "We consider the Kobelco CK1100G-2 to be the best-in-class and look forward to having a quantity of CK1100G-2 crawler cranes available for sale and rent." This month, Bigge Crane and Rigging Co., during its 102-year celebration, announced the expansion of its fleet with 24 new Kobelco CK1100G-2 crawler cranes. This crane order will increase Bigge's crawler fleet by 10%, reaching a record high of 250 crawler cranes. The purchase of these cranes was made after a rigorous evaluation in which a variety of 100+ ton crawlers from different manufacturers were evaluated on assembly time, job site efficiency, ease of operation, safety, and durability. The CK1100 series was first manufactured in 1998, and since then, there have been two variations of this model: the CK1100G, and today's CK1100G-2. When the CK1100G was first manufactured in 2011, Bigge was the first to acquire this model and put it to use on a regular basis. The CK1100 has proven to be a versatile machine due to its self-assembly feature, advanced energy saving G Mode technology, and its multi-job adaptability. Assembly of this crane does not require an assist crane and takes four to six hours to assemble based on configuration. You can see the CK1100G in action by watching Kobelco's self-assembly video. Bigge has used the CK1100G on projects within the petrochemical, wind energy, commercial construction, civil, and steel industries with great success. Kobelco offers a wide variety of resources for learning such as video tutorials, and phone support. To learn more about the CK1100G, please visit our CK1100G Crane Information Page. Bigge ranks number three in the 2018 AC&T Top 10 Largest Crawler Fleets in North America and continues to expand its crane rental services to better serve its customers. According to Weston Settlemier, President and CEO of Bigge, "At Bigge, we strive to provide the right crane, to the right market, and at the right time. This is part of our perfect fleet strategy. We consider the Kobelco CK1100G-2 to be the best-in-class and look forward to having a quantity of CK1100G-2 crawler cranes available for sale and rent." If you are interested in crane rentals, purchases or purchase options, please submit an inquiry. Bigge and Kobelco formed a partnership 15 years ago and have been bringing high-quality crawler cranes to market ever since. Bigge rents cranes nationwide and has the nation’s largest crane rental yard in Houston, with over 500 cranes dispatched from this location. Bigge’s seventeen service locations allow them to provide logistical and field support throughout the U.S. Bigge offers quality new and used cranes for sale or rent and has more than 1,000 cranes in its rental fleet. Safety, teamwork, passion, and innovation are part of Bigge’s core values. Bigge continues to lead the crane industry into the 21st century with its rental, sales, and projects teams holding generations of combined experience in the crane and rigging industry. 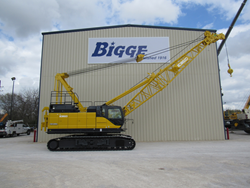 To learn more about our crane rental, crane sales, and crane parts divisions please visit us at bigge.com.